SEATTLE, Washinton: As part of ongoing work to improve connectivity and strengthen ties between British Columbia and Washington state, B.C. 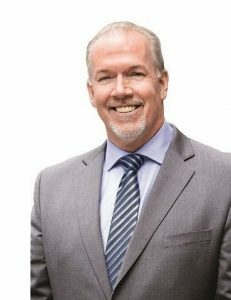 Premier John Horgan has joined Washington Governor Jay Inslee to announce that B.C. will help fund the next proposed phase of a study of a potential ultra-high-speed corridor service linking British Columbia, Washington state and Oregon. Horgan and Inslee have been working jointly to grow the region’s innovation and tech economy, combat climate change, protect the environment, promote trade and improve transportation connectivity. Collaboration on the corridor study is another step toward realizing these shared goals. In March 2018, B.C. contributed $300,000 for a business case analysis to explore ridership levels, project delivery methods, cost and financing. The full results of this analysis are expected in summer 2019. B.C. has announced the contribution of an additional $300,000 for the proposed next phase of the project that will explore models for a multi-jurisdictional authority to lead a community engagement process and preliminary environmental review. On December 10, 2018, Inslee announced that he is including USD$3.25 million in his budget for the development of a new ultra-high-speed corridor authority for Washington, British Columbia and Oregon. It is part of his broader clean energy strategy, which advances electric transportation and helps achieve Washington state’s climate action goals. Horgan is in Washington state on a two-day trip with Inslee that includes speaking engagements and meetings with government and business leaders in Seattle and Olympia, including Microsoft and the Seattle Chamber of Commerce. Horgan will give a formal address to the Washington state legislature on Friday, February 8. * On October 10, 2018, Horgan and Inslee signed a memorandum of understanding to act jointly to grow the region’s innovation economy, protect the environment and combat climate change, promote trade and improve transportation connectivity. * Funding partners have contributed a total of USD$1.5 million toward the current study [Washington state ($750,000), British Columbia (CDN $300,000), Oregon ($200,000) and Microsoft ($300,000)]. * Washington state released an economic analysis in 2018 that estimated a high-speed corridor link could create up to 200,000 jobs for people in B.C. and the U.S. and generate billions of dollars in economic benefits for the Cascadia corridor between B.C., Washington and Oregon. The analysis also estimated that within a few years of operation, ridership could reach 1.8 million annually. * A high-speed transportation corridor could reduce the travel time between Vancouver, B.C. and Seattle to about one hour from three hours. High-speed trains travel up to 400 kilometres per hour. * Total Canada-Washington goods trade is valued at approximately $26.4 billion.